Studies show that weight gain has something to do with an imbalance in your intestinal flora. Learn how to increase the beneficial bacteria, and reverse many health conditions in the process. We don’t usually think about these things, but in our bodies there are about 1,000 trillion microbes (with about 500 known species) living in our bodies that are built up of about 100 trillion cells. Most of these live in our intestinal tract with the highest number in the colon, and altogether can weigh up to four pounds! Although we often associate the word “bacteria” to something “dirty”, there are really three types of bacteria in our bodies: the good, the bad (pathogenic—infectious agent) and the neutral. Sufficient good bacteria in our intestinal tract will help with digestion, improve immune function, prevent infections, protect and stabilize the intestinal environment and has many more functions. The neutral bacteria are neither beneficial nor helpful. When bad/pathogenic bacteria outnumber the good bacteria, they not only irritate the wall lining of the intestines, they also create a host of many serious health problems (see list below). The above is just a small list. 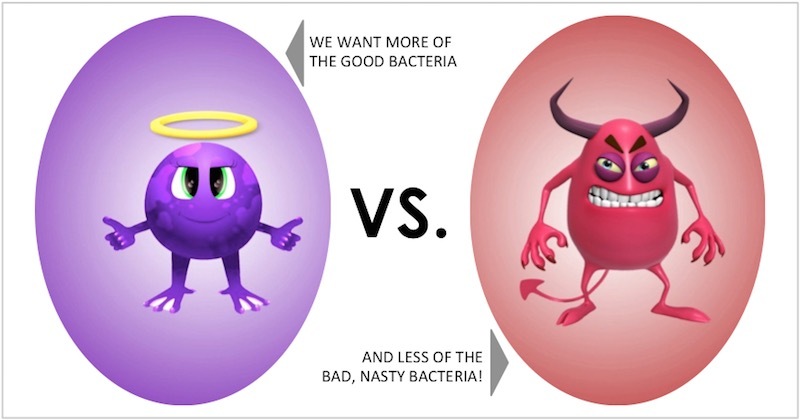 Basically, when our bodies lack beneficial bacteria, it is allowing other harmful micro-organisms to over-power and dominate the body and host all kinds of harmful bacteria, viruses, parasites, fungi, yeast, etc. And they multiply by the millions daily, so imagine the damage they can do if left unchecked!! The following video is a bad case of a guy with severe intestinal flora problem that has affected his entire body system. Lifestyle and environmental factors can easily reduce our beneficial intestinal bacteria by a great number, setting the perfect breeding ground for the harmful microbes to take over. I believe every one of us have been to the doctor once upon a time, or even recently; and been prescribed antibiotic for certain infections. Antibiotics may be a significant medical discovery, but nowadays antibiotics seem to be “loosely” prescribed for almost any problem, without advising the patients of the side effects of this synthetic compound. Antibiotics may be able to kill bacteria, but they don’t work for viruses like in colds or flu. So, by taking antibiotics when you have a cold/flu is really doing more harm to your health than really helping at all. Some other drugs like anti-histamines, birth control pills, steroids and “recreational” drugs can upset the delicate flora balance that can lead to other serious health issues. After a course of these drugs/antibiotics, the beneficial bacteria in your intestines get wiped out along with the bad ones. Antibiotics can also get into our bodies through eating of meat products of animals that have been injected with antibiotics. If the beneficial bacteria is not replaced with the right foods, it causes an imbalance in the intestinal flora. Related reading: 7 Dangerous Long-Term Consequences Of Using Antibiotics. Important: With serious cases of fungal, yeast or parasites overgrowth, most likely the liver is performing sluggishly and can no longer do its filtering work properly. In these cases, doing a series of coffee enema (for liver detox), together with healthy practices and dietary mentioned above is one of the best and faster ways to have an overall clean-up or “overhaul” the system. Read also: Why you need to detox.